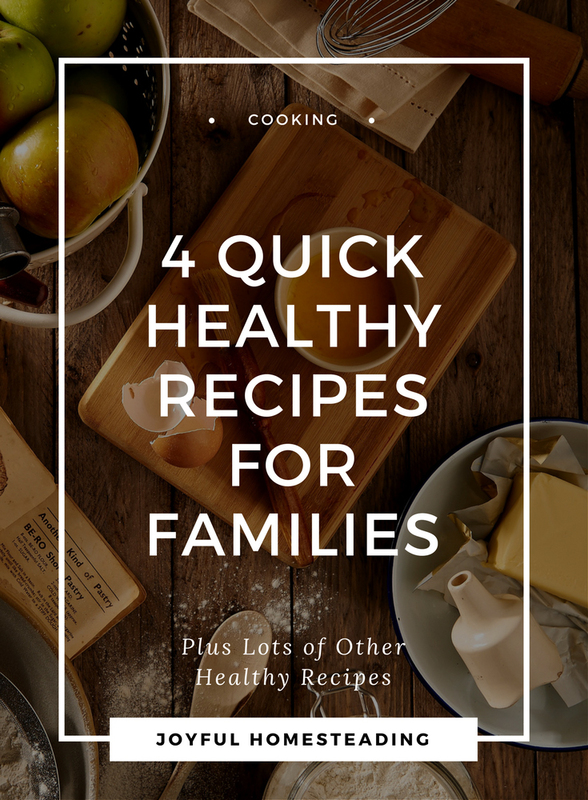 Quick healthy recipes for families that you make from scratch may sound like an oxymoron to some (sort of like the phrase "jumbo shrimp"), but these recipes typically take no more than half an hour to prepare. Considering the time involved in driving to a restaurant, or even a fast food joint, standing in line and then driving home, you truly do save time with these recipes as well as money. So give them a try. You'll be glad you did! Not only are these quick and relatively easy to make, they are low cost meals as well. Here are four healthy recipes for those days when you're short on time. This is a family favorite of our quick healthy recipes for families. Lentils are one of my favorite beans, because they cook quickly and can be added to ground beef to make it go further. It also reduces the fat of your meal overall, making it a healthier, leaner option. Brown the ground beef. At the same time, place the lentils in a small saucepan and cover with water, adding the bouillon cube to the water. Bring to a boil, reduce the heat, cover and simmer until the lentils are tender, about 15 minutes. Once the lentils are tender add them to the browned beef and add the seasonings. Warm the taco shells according to the instructions on the package. Fill the warmed shells with the lentil/beef mixture and top with grated cheese and a spoonful of diced tomatoes. The next time your kids demand spaghetti, try this spaghetti squash recipe. Not only does this squash look like spaghetti when it's cooked, but it also has a savory, buttery taste. You'll need a steamer basket like this one, and a large pot to steam the squash. Fill a large pot with about one inch of water and place the steamer basket in the pot. The hardest part of preparing this meal is cutting up the spaghetti squash. Cut it in half lengthwise and then cut it into four quarters. Scoop out the seeds and pulp. Place the pieces rind side up (meaty part of the squash down) into the steamer basket. Put the lid on the pot. Bring the water to a boil and them reduce the heat to medium. Steam the squash for 20 minutes. While the squash is steaming, prepare the tomato sauce. In a medium sized saucepan, place the diced tomatoes, tomato paste, oregano, basil, garlic powder and salt. Bring to a boil, stirring constantly. Reduce the heat and stir until the tomato sauce is well mixed with the canned tomatoes. Once the squash is tender, remove it from the steamer. Using a fork, separate it from the rind. The squash will flake into strands that look like spaghetti. Top the spaghetti with the tomato sauce. Quinoa is a low-fat way to have protein without having to add meat. I got this recipe from one of my favorite cookbooks, 1000 Vegetarian Recipes by Carol Gelles. Place the quinoa in a large bowl; fill the bowl with cool water and then drain into a strainer. Repeat 4 more times or until the water no longer looks soapy. In a 2-quart saucepan, heat the oil over medium-high heat. Add the onions; cook, stirring, until onions are softened, about 1 to 2 minutes. Add 3/4 cup sauce and the water; bring to a boil. Stir in the quinoa and oregano; return to a boil. Reduce heat and simmer, covered, 20 minutes. Remove from heat; stir in the remaining 1/4 cup sauce, the salt, and pepper. Let stand 3 minutes. Serve. My kids love this easy, quick dish. I prefer using sour cream in this recipe, but if you are looking for something with less fat, substitute plain Greek yogurt. It will have a tangier taste, but will still be delicious. In a preheated 350 degree (F) oven, bake the chicken breasts for about 25-30 minutes. Dice the cooked breasts and place in a large bowl. Add the yogurt or sour cream, salsa, grated cheese, olives, garlic and onion powder. Add salt to taste. Mix well and serve with crackers or tomato slices. Want more inspiration? Try these other quick healthy recipes for families. Lentil Rice Casserole. This simple casserole combines lentils and brown rice for a low-cost, healthy meal your kids will love. It's one of our family favorites. Spaghetti Pie recipe. It's a healthy, delicious new way to make spaghetti your kids will love. Cheesy Vegetable Quiche recipe is a delicious way to use up the extra eggs you have on hand. How to Roast a Pork Loin. If you start raising pigs, you're going to have a lot of pork in your freezer, so keep these tips on hand. Authentic Mexican Enchildas The next time you're craving Mexican, try this great frugal enchilada recipe. They are authentic enchiladas and easy to make! Healthy Corn Dog RecipesMake the best, healthiest corn dogs using this corn dog recipe. So why is cooking from scratch so important to these quick healthy recipes for families? Learn the important benefits of cooking from scratch. Ready to eat well and save money? Learn to cook well and inexpensively by following these simple tips on frugal, healthy cooking. Looking for sturdy cookware for your healthy cheap recipes that will last for generations? Look no further than cooking with cast iron. Cookware made of cast iron is relatively easy to care for, but you can insure a natural nonstick surface and cookware that will last for decades by taking these simple steps to care for your cast iron. Having a camp Dutch oven on hand means you'll have a good hot meal even if the power goes out. Learn how to cook soup and cornbread in a camp Dutch oven. Looking for an excellent source of protein that will provide your with nutrition and savings? Look no further than Texturized Vegetable Protein or TVP as a meat substitute. Honey is a healthy, delicious way to sweeten your desserts. Here are some tips on using honey in baking. The next time you want to make those gooey desserts, make your own sweetened condensed milk with this condensed milk recipe. If you're looking for a mayonnaise substitute, look no further than this low-fat, delicious, mayonnaise substitute recipe using almonds. Making your own cheese is surprisingly easy and a great way to always have cheese on hand even in emergency situations. Try this great mozzarella cheese recipe. Vegetables that have been dehydrated are a great staple to have on hand both for saving money and for emergencies. Read about the benefits of dehydrated vegetables. How important is nutrition? Read more the importance of nutrition. Want to learn how to make the best-tasting ketchup ever? Learn how to make ketchup. You've never really baked before until you've ground your own fresh flour with your own grain mill. Learn the importance of having your own grain mill. Once you get your grain mill, you'll find the taste of your own homemade bread is better than anything in the store. Try this simple whole grain bread recipe. Learn to make your own pumpkin pie from scratch using this great pumpkin pie recipe. Ready to make your own delicious and healthy cheese crackers? Try this homemade cheese cracker recipe. You can even use your crockpot for baking cake! Try this honey crockpot cake recipe. You can save tons of money when you learn to cook beans from scratch and add them to your favorite casserole and side dishes. Here's how to cook beans from scratch. Save money by buying potatoes in bulk. Here are some tips on cooking potatoes. Make your own healthy refried beans by using this great and simple refried bean recipe. Jam from your garden? You bet! Use roses from your homesteading garden to make this delicious rose petal jam. Do you have elderberries growing on your property. Learn how to make a delicious jam with this elderberry jam recipe. Make your own breakfast cereals by learning how to cook wheat berries. Make your own fresh fruit smoothies using this fresh fruit smoothie recipe. Put your dehydrated vegetables to good use with this bulgur vegetable soup recipe. If you're looking for a classic holiday drink, try this classic eggnog recipe. Back to basic nutrition is the route we should all aim for when pursuing the self reliant life. I met Tammy Maroon recently when she purchased some goats from me. This is her story of pursuing the best nutrition for her and her family by going back to basics. Canning jam is not only a great way to save money and know what's going into the food you and your family are eating, but it's also a great way to create fond memories. Here is Dee Van Houten's story of jam making. Canning peppers and cabbages, tomatoes and apples in a hot country kitchen brings more than just great preserves. It also builds happy childhood memories. Here is Karen's story of living with her grandparents. Canning fruits and vegetables is not just a skill; it's a time-honored tradition. One woman shares the canning skills she learned from her grandmother.